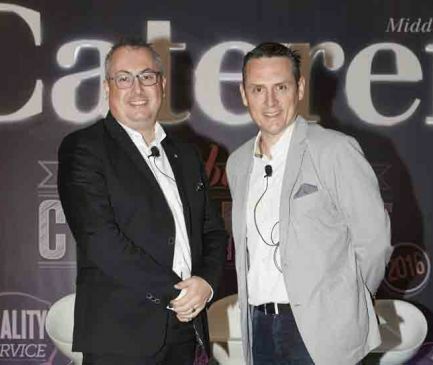 At the Caterer Middle East Middle Food & Business Conference, which took place at Grosvenor House Dubai, industry experts discussed the future of today’s food fads. Heading up the discussion was Andrew Morrow, General Manager of F&B Development & Operations for Roya International, and Russell Impiazzi, Culinary Director of F&B for Galeries Lafayette, Lafayette Gourmet. At the conference yesterday, Andrew Morrow predicted the end of the paleo diet, as well as the end of ‘superfood’ as a culinary buzzword. In both cases, Morrow suggested, the knowledge gained from the paleo and superfood trends had become integrated into common dining habits, and would continue to do so, to the point where these words become obsolete. “Food fads, especially dietary fads, come and go. But what remains is an intact knowledge that effects our dietary patterns,” Morrow began. “Paleo is on the decline now, but it has opened up the food industry. The term superfood, also came under scrutiny during the conference discussion, as Morrow argued that several 'superfoods' had now become part of our daily and typical diet, making the term no longer relevant. On the subject of superfoods, Impiazzi weighed in on the ingredient term, stating that if the cost of today’s highly fashionable Latin American superfoods deters restaurants from using them, chefs can look to cheaper, but also highly nutritious ‘traditional’ ingredients that may have become overlook in the current superfood wave.